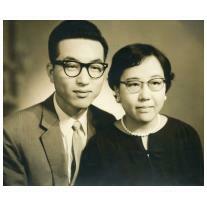 Catherine Sun Young Hong, born December 22nd in 1932 passed away March 15th, 2018. She was the daughter of Yong Yeon Francis Yim and Nam Soon Johanna Paik. She was also the loving mother of Christine Frauenhofer and her husband Thomas; Helen Hong and her husband, Michael; Augustine Hong and his wife, Susan; and Michael Hong and his wife, Yuyu. Catherine was the beloved grandmother of Erin-Ohsie-Frauenhofer and her husband, Jason; Michael Frauenhofer and his wife, Xuan; James Ong; Megan Ong; Matthew Ong; Cameron Hong; Marcus Hong; Chloe Hong; Samantha Hong; Isabelle Hong; Madeleine Hong; and Dexter Hong. She is also the beloved great-grandmother of Elizabeth Ohsie. She is survived by her sisters Theresa Park, Mary Kliauga, Frances Kim, and her brothers Sam Yim, John Yim, and Simon Yim. Catherine was a devout Catholic who was generous with her prayers for people in need. She was loving, caring, and kind, and courageous, and lived her life with the innocence of a three-year-old, and the intellect and heart of a great teacher and mother. Her legacy lives on in her children, and her great-grandchild. Her children were her life. As a single mother, struggling to raise four young children and needing to rise above her personal challenges, fought every day to fulfill her duty as a mother. She loved them unconditionally. She was always so proud of their accomplishments however small or large. She was their greatest cheerleader.